Grizzly Gulch is located at the end of the Little Cottonwood Canyon road. 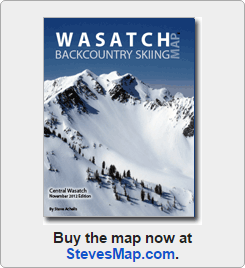 It contains excellent intermediate terrain and provides access to a large selection of backcountry skiing. 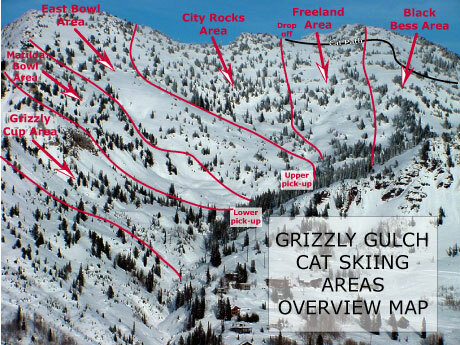 Alta ski area offers snowcat skiing in Grizzly Gulch. As such, there is almost always a groomed road to Twin Lakes Pass and to the top of Black Bess. The snowcat skiers harvest the looker's-left (north) side of Grizzly Gulch and, as shown in the photo below, have named every possible run in that area. If you turn right at the top of Twin Lakes Pass, you can access the Patsey Trees and Patsey Marley, both of which will return you to the Grizzly Gulch snowcat road. 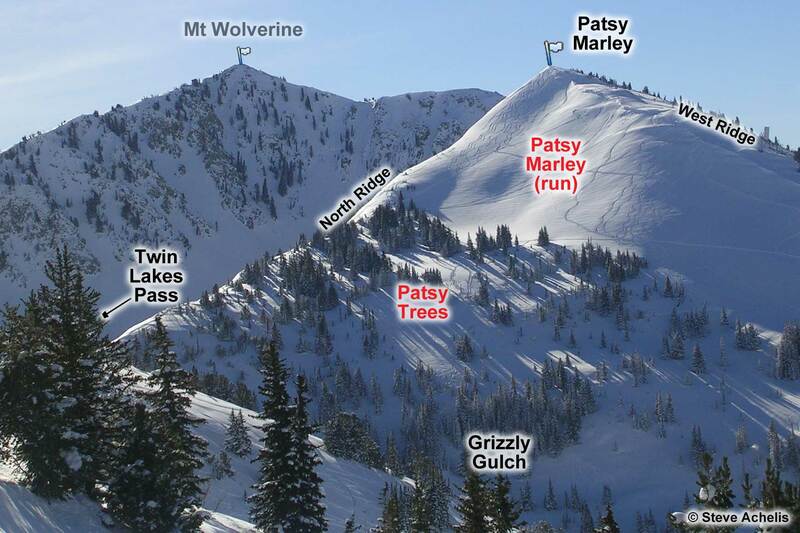 If you continue past Patsey Marley, you can access Mount Wolverine and more than a dozen named chutes within Wolverine Cirque. And if you continue past Mount Wolverine, you'll arrive at Mount Tuscarora and then Catherine Pass. See the description on skiing to Twin Lakes Pass from the Grizzly Gulch trailhead. 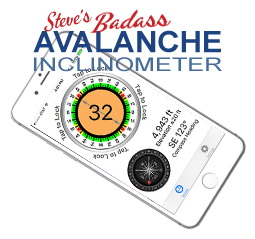 You can also ascend the south-facing runs directly without going all the way to Twin Lakes Pass.